The high school science students have been learning a lot of ‘COOL STUFF’ this year! 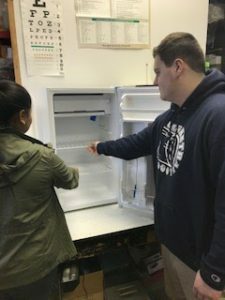 With the help of a new refrigerator, they have been able to better study the effects of temperature on living organisms. This purchase was made possible by a Mini-Grant from the Education Foundation that was funded by the America’s Farmers Grow Communities donation, sponsored by the Monsanto Fund. Students first studied the rate of seed germination in different environments like cold, hot, room temperature, light, dark, wet, and dry. They found through careful design and data collection that seeds best germinate in warm and wet environments, but really only need water to start the germination process. Light and temperature do not come into play as essentials until the plant passes germination and begins to grow and take root. After studying plants, the Biology students moved to learn more about the microscopic world around them. After swabbing different areas of the classroom, the students watched and compared how bacteria can grow in warm temperatures and in cold temperatures. This led to the discussion of why we keep our food in a refrigerator or freezer. They also tested the claim that disinfectant wipes kill “99.9% of bacteria.” Unfortunately, the wipes did not kill 99.9% of the bacteria and there were many different kinds of bacteria on our phones, desks, and pencils. So take it from the Biology students: wash your hands regularly or get sick.